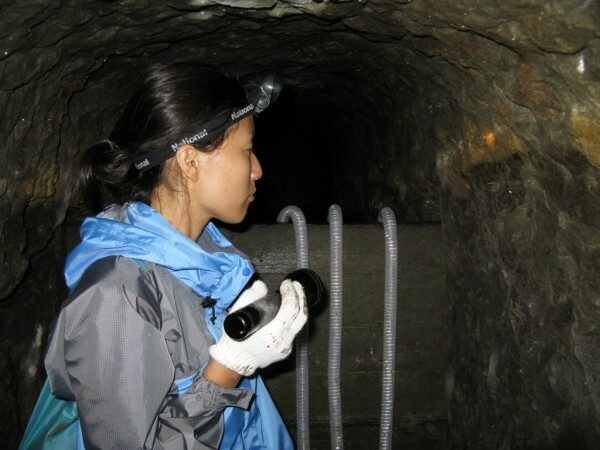 Deep within the solid rock of the Negishi Plateau in Yokohama, spreading beneath the old race-course Grandstand and Yokosuka Naval Base, lies a twisting warren of hidden World War 2-era caverns. Once filled with ancient munitions, bustling troops, and rooms full of military dossiers, they now rest in lonely silence, unexplored for up to 20 years, their secrets stopped up behind entrances back-filled with avalanche scree and trash, overgrown by thick vines in loamy earth, and walled off with sheets of blast-concrete. I first heard about the Negishi Caverns from Brian in the comments section of my Negishi Grandstand Haikyo post. Brian was a ‘navy brat’ growing up on Yokosuka Housing Area atop the Negishi Plateau some 20 years ago, who with his friends explored the ruins of the area thoroughly, including the Grandstand. He told me the Grandstand was once barred to the public by only a slack barbed wire fence (now a plate metal fence 10 feet high) and comprised of a whole extra building- underneath which were access points to the warren of caverns. Over a few weeks, Brian filled me in on his childhood adventures around the Negishi area, and I sat rapt as the emails came in. One story involved being attacked by a drugged-up homeless person in the Grandstand, who they fought off by blasting him with a fire extinguisher. 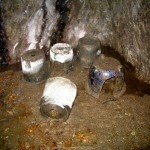 In another they stumbled upon a cache of what might have been home-made terrorist rockets in one cavern ante-chamber. As they were leaving, an old guy who lived in a nearby shack attacked them in a berserk rage with a hoe, taking chunks out of tree roots as he swung at them. They escaped, just barely, but weeks later several rocket-propelled grenades were fired at the Air Base Telecommunications Tower, ineffectively as it happened, though Brian told me he remembered being woken up by three loud bangs one morning, and later seeing the shrapnel divots in the road outside of his friend’s house by the Tower. The attacks were claimed by a Red Army Leftist group who wanted the US presence out of Japan. I’m very grateful to Brian for telling me these stories- I know how this kind of thing is valuable- I had my own childhood adventures and I wouldn’t want them to be mis-represented by anyone else. To us, they had great meaning, and I’m sure the same is true for Brian. I’m also grateful for the detailed and accurate Google Maps he sent me, with information on every tunnel entrance he could remember. At the soonest opportunity, I went to seek them out. The first trip I took out to Negishi was only a recon mission- to see if there were any tunnel entrances still accessible. I didn’t intend to venture in far, if I found any. In fact- I was quite concerned about going deep into the tunnels. The night before I set off, I lay in bed thinking of awful scenarios that could happen in a hidden tunnel, most involving me getting lost and wandering aimlessly until I died alone in the dark. Still, I went- searching for 3 main access points. Before I reached the first though, I found a suspiciously old-looking tunnel mouth at the top of the plateau cliff-face, now stopped up, underneath a car park which was clearly once a larger building. I tugged at some of the trash in this entrance, but it was firmly wedged in, so I moved on. The first scheduled stop took me up a long flight of steps to an odd-shrine/home, searching around it, then back down to the 3 three or four homes at the bottom of the cliff face. I stealthed through their back-yards, quickly strafing the wall for any sign of a tunnel entrance, even going behind a transformer power-hub and squeezing between a 20 feet tall landslide fence and the rock face- but the whole cliff had been blast-concreted over, so any tunnel entrance was completely covered. I moved on. The second scheduled stop began at a church on base and led down to the RPG shack, but I couldn’t get in since the whole area had been absorbed by the Housing Facility and fenced off. I may yet go back and try again, but at the moment have no more information. The third scheduled stop proved fruitful though. At the base of the cliff, at the start of a flight of stairs cut windingly into the rock, Brian told me of a tunnel entrance engulfed with vines and vegetation that he and his friends found by accident when they saw the greenery fluttering from an inner wind. I arrived to find the whole cliff face blocked off by a tall landslide fence. I climbed the fence, then squeezed along behind it, wedged between it and the rock face, walking 4 feet high on a long heap of land-slide detritus, rich loamy soil, tree branches, and trash. I was wearing shorts and sandals, and afterwards counted some 40 mosquito bites on my legs. Nevertheless I pressed on, attacking the cliff-wall and heaped soil with gusto, digging into it with my bare hands. I got totally filthy with the very black muck, stinking of wet and green sap. I was in the mud up to my knees and just about to give up when my fingers hooked around the lip of what had to be a tunnel entrance. I dug around some more, and cleared a 10inch gap between the mud-trash and the tunnel roof. I got out my flashlight and peered in. 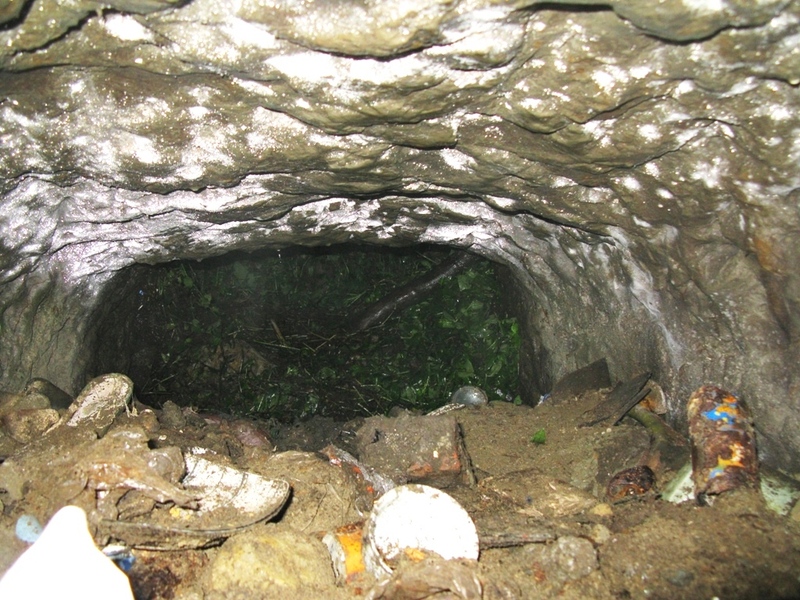 For as far as I could see, the tunnel was filled with trash and only about a 10-inch space was clear. Not wanting to get any more filthy, or dig through broken glass and other trash with my bare hands, or stung any more, I resolved to come back at a later time, better equipped. For my second trip to the cavern site I brought a lot more gear: Humvee wellington boots, waterproof pants and jacket, gloves, a new large Maglite, a shovel, string and paper and pen to avoid getting lost, and lots of batteries, water, and energy bars. 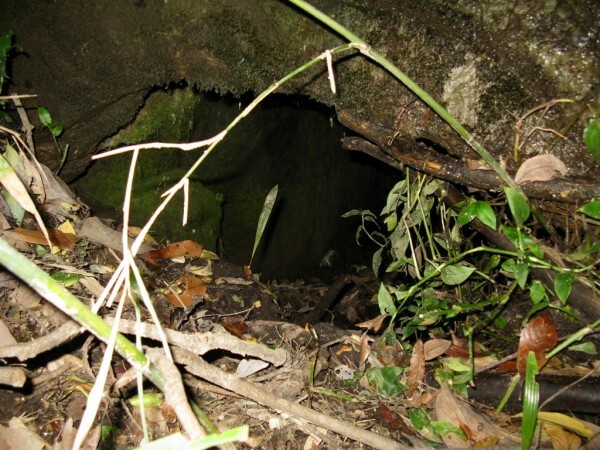 I went straight to the overgrown tunnel, no longer concerned about mosquitoes with the waterproof gear all zipped up, and tucked into digging around the tunnel entrance. I cleared a deep enough space to shimmy through, then shimmied through. Inside the trash tapered off and I could stand, but ran almost immediately up against a dead-end. 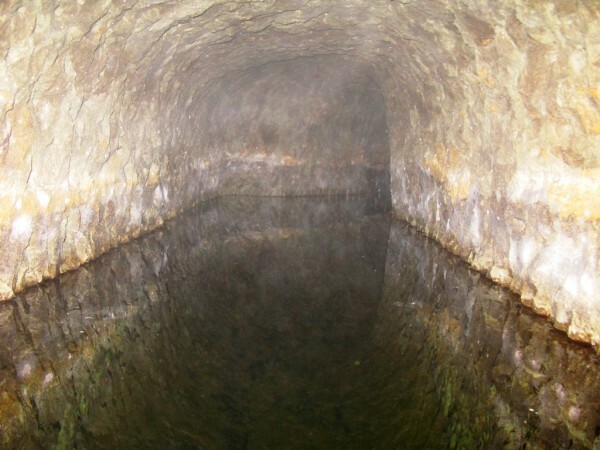 The tunnel was only some 10 meters long, ankle-deep in mucky water, and scattered about with trash- broken ceramics, shells, boots, a tyre, cans of oozing liquid tar, a doll, half a tennis racket. I took some photos, some footage, sat for a while trying to decide what to do next, then exited. But I didn’t give up. 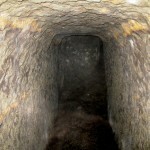 Brian had described a longer tunnel that ended in a dam-like wall, behind which the tunnel was filled with clear drip-water. I wanted to find that tunnel. I took my shovel and clambered over the heaped land-slide earth and roots to the deepest point, and got ready to start digging. Then I saw the second entrance. 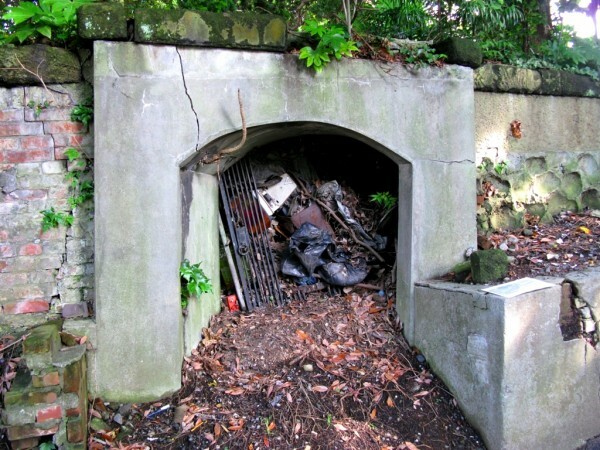 It was off to the side, in back of a nearby garden, but not filled with trash and much easier to access. I counted my lucky stars that I had seen it by chance, then hurried over and slid down. 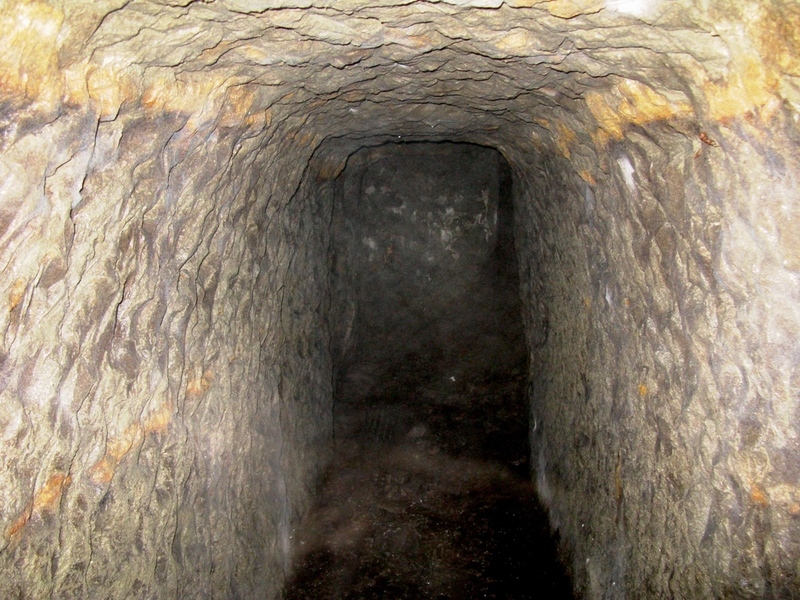 It was much wetter and muddier than the first tunnel, but also larger- it turned to the left just up ahead. I readied the Maglite and set off exploring. After the left-turn there was an empty room to the right, with a lot of buckets in the corner. Past that was a stopped up exit to the left, and the water-tunnel with concrete slab-dam to the right. Another dead-end. I shone the light out over the water, but could only make out that the tunnel turned to the right. I considered climbing the dam and wading out into the water, but it was as high as my chest- and it seemed quite a risk to take, knowing the water would be cold, I was on my own, and had no knowledge of how far the water continued. I resolved to come back with more gear. The third time I returned with Su Young- the only person brave and foolhardy enough to join me. We brought a bucket and 3 pipes with us- to first drain the water before climbing over. A lot of detractors said it would never work, siphons would never drain the tunnel- but once they were in place, the water roared through them and the tunnel drained to knee-height in about 20 minutes. I climbed over the dam, and Su Young followed. The water went into my Wellington boots, but no higher. Unfortunately, round the next corner was another dead-end. End of the road. No secret munitions stash for us, or room full of military dossiers. I began to wonder if this tunnel had ever been connected to the military. 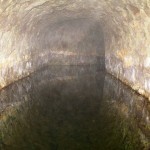 It didn’t link upwards to the base, it seemed if anything rather like a sento, or bath-house. The water from behind the dam had channels in stone on the ground to run in, channels which led around the one chamber with the buckets in, which could have functioned as seats to sit on while washing. Brian since suggested another possible tunnel entrance- which I may at some point go take a look at. At the moment though- I’m all tunneled out. Su Young with the pipes siphoning behind her. Entry – Lots of digging through muck, climbing, siphoning, scrambling. Highlights -Moment my fingers found the tunnel ceiling through muck, watching the siphon tear into the dammed water, Su Young just doing it all fearlessly. The siphoning did work well! I bet you feel like finding more things just to siphon? Too bad there was nothing around the corner after all those trips there. You are certainly willing to get much dirtier than I ever would. I would think that water would be pretty nasty. I wouldn’t want to wade through it. I wonder why there is so mush trash piled in and around there? Very interesting post. I used to live around this area so it’s amazing to find out about this. As outlandish as the stories sound, they are quite accurate. We used to arm ourselves with gas powered BB guns, bottle rockets – using whiffle ball bats as the launchers, fire extinguishers, and an occasional Chu-Hi can (shaken, not stirred). The extinguishers were everywhere in the community so they were pretty accessible and proved to be a frightful method of distraction. The homeless were never a bother except when they were high on paint thinner. And at that time, the grandstand could have been mistaken for a paint thinner factory. I think it was more “you invaded my space, now you shall die gaijin!” mentality for them or they thought we were some kind of oni. Shoot, I could have been dressed up as Momotaro and still be considered a devil to those people. The story with the old man and the hoe is very true. We were so scared, once we reached the top of the hill we hid behind a concrete shed about 100 yards into the base silently breathing very loud, dripping with sweat, yet cold and white as a ghost. We couldn’t believe he actually tried to harm us. We did, however, break a glass window in his storage hut, well, I did :). Ah, the memories. Growing up there was nice, maybe too nice. You sort of have to grow up quick. Especially, when it comes to your constitution. Beer vending machines, cigarettes, girls from Moto-Machi, late night 7-Eleven Inari and Tuna onigiri, and Akihabara are probably the worst places a 12~16 year old kid could grow up – to parents, but they sure do beat out Boy Scout camp and origami classes. I do hope Michael gets to explore the east side caverns. That is where we started our adventures. After we found the east side section and ‘spelunked the crap out of it’, we decided to investigate the entire perimeter of the ‘plateau’ and found the other entrances. I must have mistaken the water dam cave for something else – possibly the temple cave right around the corner. So, I’m sorry to Su Young and Michael for wasting their time. It has been 20 years and I thought I was quite accurate with the contents of the water dam cave. I’ll try and locate some old pictures and with Michael’s permission maybe even throw them on this specific Haikyo story. Who knows, maybe someone I grew up with may reach this site and complement my brief narrative. Oh, correction on the RPG (rocket propelled grenade), it actually was a homemade pipe bomb. A big difference, especially with the times. Someone’s going to be angry when they find you drained their swimming pool. Jason- Siphoning, absolutely. I still have the pipes and bucket- will be ready if it comes up again. Getting dirty- well, we have to suffer for our art. Tornadoes- Su Young thought the same thing. I don’t know why, but maybe because the water has dripped down through the rocks and collected- maybe over years. I’m no expert, but I think those rocks could act as a filter to clean the water. That plus there’s no light or heat down there, so nothing much can grow. – The trash is junk that has fallen down the cliff-face above, got caught by the wall, and has slowly back-filled the tunnel. Blame fly-tippers who leave trash on the cliff-top. Sebu- You made my day with your comment, thanks! I will certainly Ganbarimasu with the haikyo in the future. Tony- Thanks, though I owe a lot to Brian, without whom I’d never have even suspected there were tunnels down there. Brian- You absolutely have permission to post photos or other stories here- I very much hope you’ll be able to. As for the accuracy of the maps you gave me, or even ‘wasting my time’- there’s really no need to apologize, I don’t think you misled me at all. After all, it was 20 years ago, and you were a kid! I turned up unsure I’d find anything- so was very pleased to have found what I did. Nash- I’m not worried though, they’d have to be pretty small to use that culvert as a swimming pool. I lived in Negishi housing for four years, from 1960 – 1964. We lived at 265-B which was right next to Richard E. Byrd school (which I attended). Back then there were no local house encroaching against the Navy housing and there was considerably more green space all around Byrd school and the Grandstand. Between the school and the Navy housing to the north lie a small valley which we called “Bamboo Valley” since much of it was covered in bamboo. At the bottom of the valley there were several natural springs and up against the cliff wall on the north side of the school were some caves we used to explore also. As I remember, there were 2 or 3 of them. We always thought they were bomb shelters from WWII. 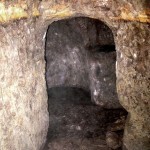 They went in a ways and had air holes dug up high into the roof of the caves. There were several alcoves that had were about 4 feet wide and started about two feet off the floor of the caves. They were only about 2 feet deep. I remember being scared witless the first time we went in because we had nothing to use for light…we felt along the walls in the dark. Once we learned about the alcoves, we would bring fresh recruits in and hide in the alcoves while they got lost. On their way out we would jump out from the alcoves and give them the excitement of their life! Another very cool thing in Negishi was a hidden set of stone steps that wound down off the bluff to the Japanese village below. These were VERY old steps and the path leading to them was very over grown with thorns and scrub brush. Once on them though, you had a shot down into the other world below. The first time we found these steps there was a dense fog surrounding the bluff so it was like descending into the unknown…but we couldn’t resist. Once down below we were treated quite nicely by the locals who didn’t seem to see many Americans. We got free candy and ice cream from several vendors. If you have the oppertunity one day,Im sure the perfect place to explore would be Iwo Jima,where a big WW2 battle took place,many died that and many are still missing in the tunnels,its under Japan millitary control now and I dont know how you will be able to set foot there. When I was 4 and 5 years old (1953-1954) we lived in building 660 in Area X on Negishi Hights. I’m not certain which unit letter but it was the one closest to the road. On a clear mornings my brother Billy and I could see Mt Fuji out of my bedroom window. I digress, I can remember my father giving us stern warnings about NOT going into the tunnels and telling us we could get lost and never find our way out. . . BTW I was able to find our housing unit using Google Earth and my memories as a 5 year old army brat 57 years ago. The steep berm behind the unit did make it easier to find. Thanks for bring some of my child hood memories back to me. Hi Brain – what years were you in those caves? My brother and I may have been in those battles with you. I lived in F Area across the street from the furniture warehouse and auto shop. 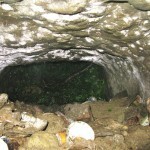 Next to our house was 3 cave entrances that we kids explored manny times. I still remember the bunkers we found on top of the hills directly behind our house. Dry Dock 7 was just over the hill fron our house. Well, lots of memories and fun times with my family. Do you have a diagram or schematic of the caves and their relative position under the navy base and town?